Ever since the great highlighter craze swept the nation five or so years ago, every makeup brand on earth has upped its stock of facial glitters, shimmers, and glow-inducers in formulas from powder to liquid and everything in between. If you have even the vaguest interest in makeup, you know highlighter is the quarterback, the queen, the Beyoncé of beauty products. Which begs the question: If we love the stuff so much, why would we stop at putting it on our faces? That's just the question the trendy hair brand IGK aimed to answer when it released its newest product: Preparty Sprinkle Hair Strobing Glitter Spray ($16), available at Sephora. This Technicolor little bottle crossed my desk the other week, and I couldn't help but feel immediately enchanted by the description on its eye-catching packaging: "Inspired by highlighters for your face, this finely milled glitter spray gives hair subtle strobing and radiance by capturing and diffusing light for a luminous rainbow effect." In other words, it's highlighter for your hair. Unlike other temporary wash-out hair glitters, this one promised to be subtle and buildable for your desired level of shimmer—nothing costumey. Plus, it's infused with vanilla extract and sugarcane, which not only smell like dessert but also work to add shine and strengthen hair. As a bleach-blonde constantly combatting color damage and dullness, I found the idea of adding an instant shine to my strands intriguing. So I gave it a shot, and so did my brunette co-worker. Keep scrolling to see our results! The application of this product is pretty straightforward: Just uncap, aim, and spray throughout your hair (starting with short pulses so you don't overdo it). The mist is indeed as fine as promised, and it smells like a sugary-sweet candle (but not in a headache-inducing way). I will say, I did experience some clogging with the nozzle. Luckily, the brand sent me two bottles, so all was not lost, but if you happened to order the product and experience the same trouble, Sephora has an amazing return policy and would replace yours right away. Immediately, the mist deposited a beautiful, super-subtle layer of rainbow—more a fine shimmer than a chunky glitter—that made my hair glisten in the sun. A few more spritzes upped the effect, though it never looked over-the-top. My brunette co-worker, Alison, who had an important presentation the evening of this test, was nervous the product would make her hair like a disco ball, but it was so understated and pretty that from far away, it just looked like her hair was extra shiny. I wouldn't call this a downside, but I will say that even though this hair highlighter looks absolutely beautiful in person, you would have to spray a lot—like too much for a regular workday or business presentation (though probably just enough for a party)—for it to show up in photos. Below are two images of the product from the Sephora website and above are the "after" photos we took here at Byrdie HQ, in which I think our hair maybe looks shinier, but definitely not full of rainbow glitter. It was actually surprising how little you could see the product in photos because it was so lovely and visible IRL. My theory is that it shows up way better on camera when applied to straight hairstyles, as opposed to our loose waves, which seem to camouflage the effect. The instructions do say that in order to lock the glitter in place for hours, finish off with a hair spray. Photogenic or not, I loved how this product looked in person and can absolutely see myself using it to top off any style (even a daytime one) when my hair needs a little boost of shine. 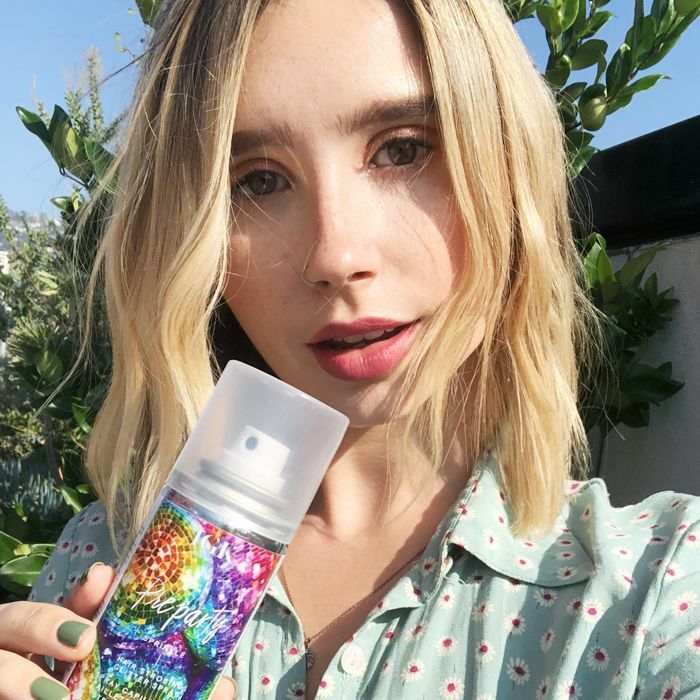 Better yet, the product is vegan, cruelty-free, offers UV protection, and is formulated without gluten, petrolatum, mineral oil, parabens, or sulfates. Want more hair content? Don't miss the easy hairstyles that earn Byrdie editors the most compliments.